The structure of hadrons such as protons and neutrons, their excitations, and the interactions between them are all essential manifestations of strong-interaction physics. Lattice QCD calculations are key to providing an ab initio understanding of these phenomena, and to revealing possible new physics beyond them. The calculation of the low-lying spectrum of bound states is a stringent test of high-precision lattice calculations. The experimental investigation of the excited states of QCD has undergone a resurgence, including the observation of new states in the Charmonium system at Belle and at BaBar, the search for the so-called missing baryon resonances of the quark model using CLAS at JLab@6GeV, and the flagship search for so-called exotic mesons at GlueX at the upgraded JLab@12GeV. Calculations by USQCD are playing a vital role both in describing existing data, and in predicting the outcomes of future experiments. Lattice QCD calculations of the meson spectrum suggest the presence of many exotics. A striking example is the spectrum of meson states, shown in the figure. The isovector and isoscalar masses are denoted by the grey and black/green bars respectively in a calculation with quarks having a pion mass of 396 MeV, with the light/strange quark content of the isoscalars indicated by the fraction of black/green in the plots. These results suggest the presence of many exotics in a region accessible to the future GlueX experiment at JLab. One of the great challenges posed by QCD is understanding how protons and neutrons are made from quarks and glue. Thus a cornerstone of our effort is achieving a quantitative, predictive understanding of the structure of nucleons and other hadrons using lattice QCD. Our lattice calculations are directly relevant to experiments at JLab, RHICspin, SLAC, and FNAL, and will have significant impact on future experiments at the JLab 12 GeV upgrade and a planned electron-ion collider. Contributions of quark spin (blue points)and quark angular momentum (red points)to the spin of the proton, compared with experimental results from HERMES. The figure at the right shows how our calculations are advancing our knowledge of the origin of spin in the proton. The blue and the red points show the contribution of quark spin and quark angular momentum respectively, for both the u and the d quarks to the spin 1/2 of the proton, with decreasing pion mass. The bands show the dependence expected from chiral perturbation theory as the pion mass approaches its physical value. The spins carried by the up and down quarks agree with the black crosses denoting the experimental HERMES results. The strong interactions between baryons, such as the proton and neutron, are key to our existence. Together with the electroweak interactions, they conspire to produce the spectrum of nuclei and the complicated chains of nuclear reactions that allow for the production of the elements forming the periodic table at the earliest times of our universe and in the stellar environments that follow. Decades of experimental effort have provided a precise set of measurements of the nucleon-nucleon scattering cross sections over a wide range of energies, which have given rise to the modern theory of nuclear forces. Lattice QCD calculations are needed to determine three-body interactions and to complete the connection between nuclear physics, and the underlying theory of the strong interactions. The mass of the H dibaryon compared with the mass of two Lambdas, showing the H as a weakly bound or near-threshold resonance. An example of recent progress at understanding the interactions between baryons is that of the Hi-dibaryon, a theoretically predicted two-baryon bound state with two strange quarks. 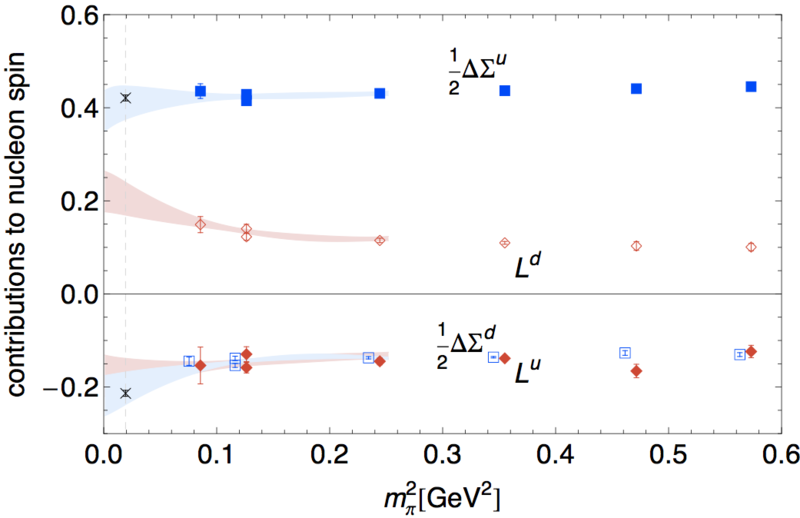 We calculated the mass of the H-dibaryon, and compared its mass with that of two free Lambda baryons, each composed of one up, one down and one strange quark. 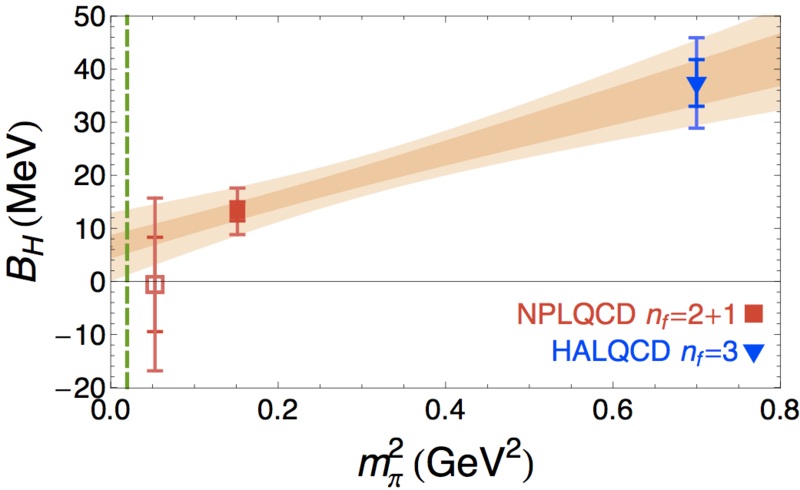 The red points show our calculation, performed by the NPLQCD collaboration, while the blue points show one by the HALQCD collaboration; the band shows possible forms of the pion mass dependence, and suggests a weakly bound or near-threshold resonance at the physical pion mass. Precise measurements of properties of known particles provide a means of searching for particles and interactions beyond those of the Standard Model of the strong and electroweak interactions. An example is the investigation of nuclear parity violation.